The best way to pay respect to a gift is to develop it and then given it away. Jolie Rocke Brown has done that all of her life. 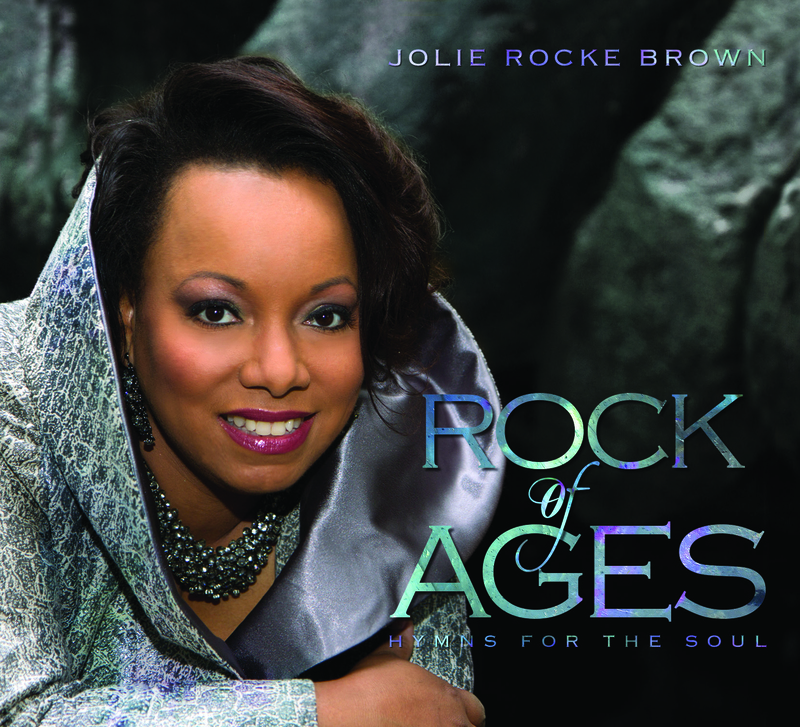 Her first cd is self-entitled as “Jolie Rocke Brown in Concert.” It’s a classical CD with arias, art song and spirituals. Her current CD is an infusion of jazz, gospel and classical. We’re going to get to know more about Jolie Rocke Brown the person, vocalist and educator. You have such vocal versatility and do jazz along with opera. Tell us about your newest CD and what level of involvement did you have with the music and the arrangements? “Rock of Ages: Hymns for the Soul” was released in November 2013. I am so excited to share this work with the world. I was involved in shaping the arrangements to suit my specific vocal capabilities. Working with two colleagues and friends, the arrangements primarily by Dan Campolieta and production by Joel Martin was a fruitful collaboration. The three of us sat down and discussed each arrangement and elements we each wanted to incorporate. Since it was an independent project, I had the ability to make the choices I desired. Having worked with Joel and Dan for years, I felt comfortable accepting their suggestions because I knew they understood my voice and each style I perform extremely well. I could not have asked for a better team. I even co-arranged with Joel, Dan and Benjamin Gary. Your mom recognized your talent early on and got you started on your musical journey. Was this something that you absolutely wanted to do? Yes, I loved to sing and I wanted to do it. My mother gave me the best kind of support. I started taking private voice lessons when I was 10 years old. I loved them from the first lesson. I decided I wanted to have a singing career when I was about 12 years old. I also wanted to be a music teacher. My mom allowed me to find my way, and to do whatever I believed I could do with my voice. Opera has not been a favorite among African Americans. In fact, a lot of people consider this to be “white people’s music.” Have you ever faced that criticism and stereotype from African Americans and if so, what do you do with it? I have faced criticism and racism in music from all races of people, including my own. We must realize that music is extremely subjective. What I like, you may or may not like. That goes for vocal preferences with gender, persona, musical genres, tone quality, tonality… there are too many areas to address here. So, I have learned over the years to sing what I love and want to sing. Some people like my opera better than my jazz; or my R&B better than my opera; or my gospel better than anything. You can’t please all of the people all of the time. I sing what I enjoy and share the gift with which I was endowed. Since I am still singing professionally, enough people must like what I offer. In speaking with other major performers, they have said that they wish there could be more Black people in the audience so they can get exposed to the kinds of music they’re doing. Do you share that sentiment? I think more people should be in the audience period. Especially children. For some reason, adults leave their children home instead of bringing them to concerts and arts performances. Why? How do we raise a generation that will support the arts? We teach them to love the arts – and that begins with attending live performances. You experience live arts with many more senses, and it brings the arts alive. Why deprive our children of this experience? Then we wonder why audiences are filled with older people. It’s not just economics folks. You do workshops and presentations for teenagers. These are kids who probably have never heard opera or operatic singing. Are they receptive to your vocal performances? ABSOLUTELY! I love singing for young people. I don’t like when they sit there in a coma and stare through me though. My best audiences are ones where the young people can’t wait to ask a question or make a comment to a friend next to them. It tells me as a performer that they are super engaged and want to know more about what is going on. So the mild buzz in the audience doesn’t bother me, it excites me. I am often asked, “How can you make that huge sound?” Then, I can tell them about the voice and how it works as an instrument – one I carry with me everywhere I go. I find that when young people are encouraged to analyze and explore something new, they are more open and accepting. When we tell them “sit still”, “be quiet”, “don’t talk”, we are in essence shutting their sensory perception down before they can even get started. The more our children can experience great singing, the more they can learn to appreciate it – even if they don’t “like” it. What do you give them during one of your workshops — what do they learn during one of your programs? I am very passionate about what I do. So as soon as I stand in front of young people, it shows. Passion is infectious! I love learning and talking about the voice as an instrument and explaining how much one must know about their body to sing well. I love singing in various languages, and letting young people know that I grew up on welfare, in a poor neighborhood, but in my adulthood I have traveled across three continents, and I have dreams of traveling more. I let them know that music is a viable career, but one in which you must be willing to create your own opportunities. I love telling the stories and historical facts about the songs I sing. I also share what happens behind the scenes. It takes a huge community backstage to support the artists on stage. Some awesome opportunities in the arts are backstage careers. Don’t forget, someone has to be in the audience too! You grew up in New York City and attended a musical high school. Then you went to the Hartt School in Connecticut to continue your music education. You settled in Connecticut from there. Why did you not go back to New York to pursue your musical career and how has working with Connecticut as your home base served you? Connecticut has served me well, and I pray that I have served Connecticut well. I remained in the Hartford area because I wanted to teach. After several years of teaching, I launched a professional singing career part-time. I’ve been singing regularly in the Greater Hartford region for more than 15 years. It is truly a blessing to call Connecticut home. Staying here afforded my husband and I the opportunity to maintain a stable home for our children, provide music education for a generation of Hartford area children and build a promising singing career. I am very grateful and feel I made the right choice. You have performed in a number of places around the world. How did you get those kinds of gigs and how does it feel to be an invited guest in a foreign country? My first visit abroad was to Germany. My voice teacher had a long-term singing contract there. I visited him to see what singing in Europe was all about. I learned heaps and got the travel itch! When a friend emailed me an audition announcement for a European tour, I sent my materials immediately and was hired. The best way to travel to Europe or anywhere is when someone else is paying the bill, and paying you! It is an honor to represent the United States of America when I am performing abroad. There is so much to learn and experience, but one also soon realizes that other parts of the world are not so different from the USA. People are people, and we all have triumphs and struggles. Recognizing that the voice is an instrument, do you play any other instruments? My talent is singing. In college I had to take two years of piano study. I can manage very poorly on the piano. I also briefly studied the recorder, flute, clarinet, trombone and violin. It is helpful to have an understanding of how instruments work. I encourage everyone to study and instrument along with voice, especially harmonic instruments like the piano, guitar, or ukulele. Of all the people you trained with, who was your favorite instructor and what did they give you that you cherish the most? That is a difficult question because I don’t want to hurt anyone’s feelings. I have had excellent voice teachers since I was 10 years old. However, I think David Lee Brewer was the best influence on my voice and career development. He taught me to love my instrument and trust the gift God gave me. He also taught me to be more aware about the business of music. As a professional musician, you must handle both aspects well, even when you have management and a business team. What good is the team if you don’t know what they are doing for you? What do you give your students? I help my students develop solid technical skills. I encourage them to find their path and help guide their focus. I also give them opportunities to perform, which is essential in honing performance capabilities. They don’t have to choose a music career; they have to first be happy. You’ve done some theatre. Is there more of this to come? What are your plans and how will you accomplish them? Much more to come! Currently, I am performing with Bated Breath Theatre, a Hartford based company. I love the work we are currently performing – “Freedom in Three Acts”. I believe this style of theatre suits me well. I plan to continue working with them and seek additional opportunities in this genre. As you look back at your musical life and what you have done and the places that you have been to perform, are you satisfied or do you wish there was more? Why or why not? I am exceedingly blessed to have the life I am living. In my high school yearbook, under my photo I placed an anonymous quote that has remained in my heart – “Time is not measured by the passing of the years, but by what one does…. feels… and achieves.” Sharing the gift of song is a great feeling and achievement.